ShinDengen has launched the MG032 series of modules that the company developed for industrial motor inverter circuits. According to the company, the module’s compact structural design allows a great reduction in parallel connections of components compared to discrete mounting. Typical applications for the power module include integrated starter generators, forklifts, industrial equipment, and electric motorcycles. This insulated power module does not require additional insulation work that is necessary when using discrete semiconductors. 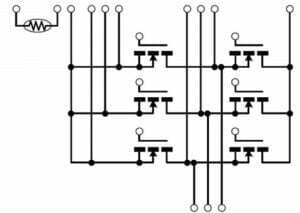 The device allows a reduction of the number of parallel element connections, which reduces the stress resulting from wiring, heat dissipation, and other imbalances that occurred when making multiple parallel connections in previous discrete semiconductors. A large power capacity enables a more compact design through use of elements that the company developed specifically for this module and high heat dissipation packages. The MG032 comes in two versions, MG032A4207R5A and MG032B420010A. MG032A4207R5A features a Vdss rated up to 75V and the MG032B420010A has a Vdss rated up to 100V. Both have an Id up to 420A, an Idp up to 840A, and a Pt of up to 500W. Both also have a typical Vth of 3V. The MG032A4207R5A model has an Rds(ON) of up to 0.98mΩ, and the MG032B420010A has an Rds(ON) of up to 1.37mΩ. On The Web: Shindengen Electric Mfg. Co. Ltd.